Boss Chick Rasheeda Frost shared a new picture where she is makeup-free, and while many are complimenting the reality TV star on her natural beauty, others find she looks tired and stressed out. Those same fans are bashing Kirk Frost for putting his wife in this unpleasant situation. In season 7 premiere of Love & Hip Hop: Atlanta, Kirk finally confessed that he is the father of baby Kannon. 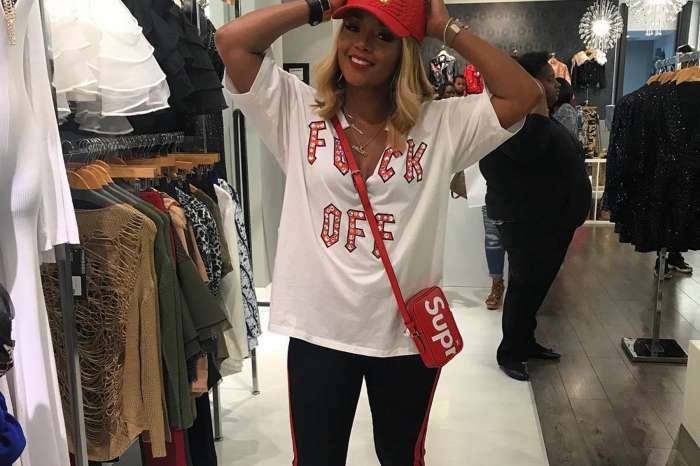 Supporters believe that Rasheeda is secretly suffering from the pain and humiliation caused by the affair with Jasmine Washington and it is starting to show on her. One person went as far as claiming that Rasheeda appeared like she was crying in the photo. #ad Tummy Makeover? You already know I’m in on this @flattummyco. I’ve been combining my workouts with their Flat Tummy Shake program for a few months now and seeing some crazy results… even better than I expected! My jeans are fitting a bit better, my late-night cravings are under control and my stomach is looking good! With 20% off all products right now, I’d say it’s about time I re-stock. If you want to do this with me, you should check them out before their sale ends! However, a third fan found she looked stunning and should be left alone. A source claimed that Rasheeda had a tough time deciding if she should leave Kirk or work things out. Rasheeda has played her cards well because she has become one of the leading pieces on the hit show.